We live in a healthy world where exercises became an indispensable part of our culture. Nowadays, everyone works out, even though; we have so little time to use it for it. Therefore, going to gym or pool is time-consuming. However, is there another solution? Yes, there is. Best Home rowing machines are a great way to use your entire body in one single exercise. You just have to assemble it and place it in the room. That way you will be able to exercise in your place, under your rules and without people around you. Looking for home treadmill review? np, we recently published best home treadmill article, enjoy!! 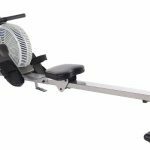 Best sellers link from Best Home Rowing Machine category. The Concept2 Model Rowing Machine is an excellent piece of machinery that will give you the possibility to handle any workout. At the same time, you can have full body workout for any fitness level. It includes flywheel that will provide you smooth operation after each stroke. It is noiseless and portable. You can break it down into two parts, which are great for mobility. There are numerous options such as pre-load games, workouts, and the possibility to transfer different data from online apps and PC. This particular model contains excellent rower, which is specifically designed to provide you the in-home workout of the full body. It will hit all muscle groups until you reach the perfection. A well-designed product comes with a long warranty. That way you can ensure that, it will stand the test of time. It is simple to use and set up, as we have mentioned above. That way you will not have any hassle in moving it from room to room. Concept2 Model E comes with PM5 Performance Monitor that will help you enjoy all the way. With the impressive amount of features, you will get a high-end rower. First, we have to mention that it wirelessly receives information from Garmin chest strap that contains heart rate, monitor. Besides typical features such as heart rate, hear pressure, you will be able to enjoy in different games for maximizing your training and rate. You can also race against another rower, or against your previous workouts. That way you will get more motivation to continue to exercise and to improve overall performance. PM5 contains memory card so that you can transfer and store workout information to a computer. There is also a way to connect it to online apps for both iOS and Android users. Even though everything that we have mentioned sounds like high-tech, it is simple to use. You will be able to assemble it in 15 minutes. The combination of simplicity and technology is the reason why people choose this particular best home rowing machine. In overall, you will get high-end rowing machine that will stand the test of time. It contains powerful computer and performance feature so that you can work out with ease and comfort. On the other hand, it has an uncomfortable seat, but that is the minimal problem when you compare it with other rowing machines. By purchasing this particular machine, you will get a combination of high-quality performance, durability and what is the essential budget-friendly price. We have all heard about Oxford and Cambridge Universities. WaterRower Oxbridge Rower got its name from these two elite schools. It comes from exotic cherry hardwood, and it is sturdy and hard enough so that you can enjoy all the way. When you decide to row this particular rowing machine, you will feel similar to rowing a boat. Excellent workout feedback will appear on the S4 monitor. Therefore, we can conclude that this is the high-end product. So what is the deal? It comes from commercial quality from the USA, and we have mentioned above the sustainable cherry wood. Similar to other WaterRowers, it contains water-based flywheel, which will reproduce the same physical sensation as if you were really on the water. It also includes an S4 monitor that will provide you all data on your performance. It is appropriate for everyone, which is the reason for its popularity. You can quickly start even if you are an elite trainee or just a beginner. Oxbridge includes set of paddles in the encoded tank. That way paddles will provide you quiet and smooth resistance, which is similar to riding boat paddles in the water. When it comes to design, we have to mention that everything is handmade. The wood is solid cherry and color can vary from deep red to reddish-brown. Of course, because of the nature of wood, it will darken over time especially if you expose it to impressive amounts of light. If you want to provide you wood extra warmth, you do not have to worry, because you will get Danish Oil in the package. Cherry is an excellent wood for rowing machines because it reduces noise and vibration due to its specifications. That way you will have a convenient and comfortable workout and water rowing simulation. It measures 84% of muscle mass, which is much better than another aerobic machine. OF course, exercise is low impact so that you will remove pressure from knees, ankles, and hips. It comes with S4 Monitor that contains excellent features. You can easily connect it to PC and synchronize it with other software or applications. It includes six workouts, and you can set additional goals based on your preferences. The monitor will save nine sessions so that you can compare your previous results and get more motivation. As you can see from everything that we have mentioned above, Water Rower Oxbridge Rowing Machine is simple and great to use. It will provide you excellent workout guidance, and it will last for generations. If you want to find eco-friendly and best home rowing machine for commercial or household use, we recommend you to choose this particular one. Even though it looks odd, Sunny Health rowing machine is excellent to provide you perfect workout experience. It is full motion rowing which means that you will be able to change three different strokes. Even though there are numerous best home rowing machines available on the market, this particular model uses magnetic resistance, which is an excellent and durable feature. It is simple to use and simple to assemble and you just have to follow instructions, and in one hour, you can make it work. When it comes to design, it includes lightweight steel that will provide you substantial durability and performance. With three hydro blades, you can mimic the similar movements as competitive rowing. The seat is molded and padded which is perfect because you will be able to get additional comfort while using it. Finally, you will be able to row on the water in your home. This particular machine creates tremendous and steady rowing performance that will look similar as you were doing it for real. At the same time, Sunny Health includes R2 fitness meter that will accurately track all workout data such as total strokes, total time, ambient temperature and many more. You will be able to track progress on the digital monitor screen so that you can see how fast your heart is betting and to correct intensity of workout plans. However, the main disadvantage is that you won’t get heart rate strap, but it is not that expensive. You can also choose distance and time so that you can get additional motivation and focus on understanding and reaching your personal and professional goals. Levellers are on the bottom, so that you can level the machine with the floor. Just turn the leveler to see whether everything is right or wrong. Sunny Health rowing machine is an excellent choice because it will provide you excellent rowing stroke, which is both strong and smooth. It is durable and sturdy, which is the other reason for its popularity. Of course, it comes with some disadvantages, but that is nothing when you have in mind everything that you will get with it. We recommend you to choose it because it contains excellent fitness technology, and it is affordable at the same time. It is an excellent choice for your home workouts. When we researched best home rowing machines, we stood at the Concept 2 model D rowing machine and found out that it is indeed the best on the market. Even though it has the high price range, which is not for everyone, but you will get what you pay for. That is the fact. We can say that this particular rowing machine is almost indestructible when it comes to building quality and design. At the same time, it is full-body workout machine that you will be able to put it in your home. It doesn’t matter if you are professional or a beginner because with this rower you will get what you always wanted: a perfect body that you made in your home. First, we have to mention that this particular best home rowing machine is an air-resistance rower. That means that you will have to pull a handle to spin a fan flywheel. As it turns, you have to displace the air, and that causes resistance. The faster you do it, the more air will come and the more strength you will get and feel. To say it just, you determine the resistance level by your performance. The harder you row, the more resistance you will get. It is simple as that. You will get rowing motion, which is similar to doing it on water, without any lags while stroking. It is ultimately maintenance free, and you will be able to fix it in no time. On the other hand, you can change damper settings, which varies between 1 and 10. The numbers will represent the amount of air inside the flywheel, which will later effect on resistance and rowing stroke. It includes a PM5 monitor, which is one of the most popular ones on the market. It comes with fitness data tracking, and you will be able to choose different options as workout preferences. In overall, Concept 2 model D rowing machine is an excellent choice if you want to make a home gym. It doesn’t matter whether you are professional or a beginner, because most owners and users stated that it would stand the test of time. It has excellent performance monitor with amazing features that will allow you to monitor and work your entire body. You have probably heard about Stamina rowing machines that have high quality and similar design. Stamina ATS Air Rower is an excellent solution for your household workout because it comes from durable and sturdy materials. But let’s see everything from up close. First, we have to mention that it comes from aluminum seat rail that will provide you smooth gliding seat and reliable support. The strap is from nylon so that you can enjoy in durable rowing stroke. It also comes with floor protector so that you can protect workout space and have additional support. You will enjoy a comfortable design that will glide smoothly. Because of oversized seat rail, you will get relaxed rowing strokes. At the same time, textured grip on the handle will prevent frustrating hand fatigue. It works on Air Transfer System, which means wind resistance for efficient rowing stroke. However, it is noiseless when compared with other rowing machines on the market. It includes multi-function electronic performance monitor that will display Total Strokes, Distance, Speed, Calories Burned, Time and Strokes per Minute. If you want to turn on the monitor, you just have to press the button. It will turn off automatically after two minutes of inactivity. The main downside is that you will not get heart rate monitor with it. You can use a smart phone or any other mobile device to record heart rate or purchase fitness watch or another gadget that could help you do it. At the same time, the monitor doesn’t have workout programs and present, which is terrible when you have in mind its high price. It is simple to store it, and you just have to remove the locking knob and pull the pin, fold the seat and reinsert locking knob and pull the pin. It will take you thirty seconds, which is impressive. It also includes built-in wheels so that you can move it without any additional hassle. As we can see from everything that we have mentioned above, Stamina ATS Air Rower is an excellent choice if you want durable and rowing machine with decent performance. The main disadvantage is that you will get a primary monitor with not so many features. That is not so good when you have in mind the price that you have to pay for it. On the other hand, you will get all features that you need to keep your body in shape and steady. The build quality is stable and durable, which means that you will have it for decades. It is your choice. There are different rowing machines on the market, but the Sunny Health & Fitness SF-RW5515 Magnetic Rowing Machine is something different. Finally, you will be able to purchase magnetic rowing machine for the affordable price. We all had experience in seeing that most magnetic rowing machines are above $500. The other solution was to choose hydraulic rowing machine, which produces too much noise. The build quality is quite stable and sturdy. It includes heavy-duty steel mainframe. According to numerous users, it is very sturdy for its price. The rowing handle comes from reinforced nylon strap so that you can avoid smooth rowing stroke and fraying. It is very quiet, and you won’t get any frustrating clinking or squeaking noises. When it comes to comfort and ergonomic features, it includes a padded seat with non-slip handlebars for additional convenience. With large foot pedals, you can comfortably fit any shoe size, and you can adjust it to make sure that everything is on the place. It doesn’t matter how much you use it because it will always remain comfortable and stable. That is the main reason for its vast popularity. We have mentioned that it works on magnetic resistance. That means that it uses magnets in the flywheel that creates resistance on spinning metal drum. It is a different mechanism from Water, Air, and Hydraulic rowers, because it will provide you the noiseless and smooth rowing motion. You can choose eight resistance levels, and you just have to turn the knob to adjust it on the panel. It includes significant LCD monitor that can track data such as calories, count, time, and total strokes. It works on battery so that you won’t have any hassle with outlets. In overall, Sunny Health & Fitness SF-RW5515 Magnetic Rowing Machine is one of the best rowing machines on the market. It will provide you a combination of decent performance, excellent features for a fantastic price. If you want high-quality rowing machine for low cost, this is the choice for you. Of course, it has some disadvantages such as computer features and workout games, but it will apply to you if you want a machine that will help you increase the body mass. It doesn’t matter if you are a professional or beginner because you just have to sit on it to feel the difference. This is another Stamina home rower, but this particular one works on magnetic resistance. According to numerous users, Stamina Avari Programmable Magnetic Rower is one of the best magnetic rowing machine on the market. The build quality is decent, and most people that own them were happy with it. There were no user compliments when it comes to its build quality. It includes a steel frame and aluminum beam. At the same time, pulley system comes from durable nylon strap that won’t fray and wear. Even though most people think that metal chain is better and more durable, nylon straps are much quieter and work fantastic. Comfort is also essential for best home rowing machines. Stamina Avari Programmable Magnetic Rower is an absolute winner when it comes to support. It is smooth, quiet and comfortable even after an extensive workout. Footrests contain durable Velcro pivot, and straps and handle come from a padded material, which will reduce the amount of fatigue afterward. The main disadvantage is that seat is too hard, and it can become uncomfortable after extensive use. It works on the magnetic type of resistance. That way, when you pull a handle, the metal will begin to spin. The closer magnet is to the flywheel; you will feel more resistance. The farther – the less; it is simple as that. It is impressive because you will get quiet performance. This is one of the most significant benefits of purchasing home rowing machine with magnetic resistance. In case that you have people around you, or you live in an apartment, this is the perfect choice for you. In overall, if you choose Stamina Avari Programmable Magnetic Rower you will get one of the best magnetic rowers in [year] on the market. It has impressive rowing stroke, excellent resistance, and smooth operation. You will also get advanced monitor and heart rate monitor, which is the unique feature. Apart from the uncomfortable seat, this excellent and rowing machine is the perfect solution if you want the healthy possibility to workout in your home. If you want to choose affordable and yet quiet rowing machine with great features, you are in the right place. Finally, we decided to present you Sunny Health & Fitness SF-RW5623 air Rowing Machine, its one of the best home rowing machine under 500. It comes with decent performance rate so that you can enjoy all the way. If you want to engage and challenge yourself with numerous tricks of body workout, you should consider reading further. The first thing that we have to mention is that it is utterly lightweight with sturdy construction so that you can enjoy a safe workout that will stand the test of time. It includes three air blades for realistic motion so that you can get the competitive feeling like you resisted by air, it adds more dynamic response resistance based on the stroke power and speed.This particular experience will provide you smooth action on each row. With padded seat finally, you won’t feel discomfort after extensive use. The measurements of position are 10 x 12.5-inches, which is, according to owners and previous users, perfect for more extended rowing sessions. It has rubber grips which makes it anti-slip for secure footing, it has wheels for easy movement and storage. You will be able to place it against the wall in case that you don’t have horizontal space. You can work 85% of your muscles by using this particular machine. It will affect your back, arms, legs, abdominals and what is most important, you won’t leave with sore muscles. You don’t have to worry because it won’t affect your knees, joints or back as other exercises and workout machines. With it, you will get digital Fitness Meter that will show you total time, calories, 500m time, HR, full strokes and ambient temperature. You will be able to track all exercise data accurately without any additional problem. It works on resistance that has no limits, moreover you can feel the cool air on you face with every pull you with this air rower. With large footpads, you will feel safe while exercising which is a convenient solution for your household. In overall, Sunny Health & Fitness SF-RW5623 air Rowing Machine is an excellent solution if you want an affordable model with great features. Of course, it lacks advanced display and wood frame, but you will be able to enjoy in working out for decades. It is entirely stable and comfortable, which is excellent if you are a beginner and want to start to exercise frequently. You don’t have to worry, because every piece is entirely safe, and you won’t be able to damage it after extensive use. Finally, you will be able to purchase high-quality home rowing machine for the affordable price. You don’t believe it, check Stamina Body Trac Glider 1050 rowing machine, and you will understand what we want to say. You will get a compact machine that weighs only 40 pounds. That way you can easily store it and move it around. It contains dual handles that will allow you a full range of motion. You can also change resistance levels and enjoy in the high-quality monitor that will keep track of everything. First, we have to mention the build quality which is excellent especially when you compare it with more expensive home rowing machines. It includes aluminum center beam and steel frame that will stay in your home for decades. It is incredible to compare its sturdiness with lightweight. It is entirely quiet and only time when you will hear some noise is from seat rolling back and forth. This will make a sound like a skateboard on the sidewalk. The main component for all rowing machines is a comfort, and you will get an ergonomic product that you can use for an extended period without any problem. When it comes to resistance, it works on single hydraulic-piston that you will find underneath the molded seat. It operates by twisting a knob to close and open small hole inside. The lower the shaft, the harder it will get you to move the handle. Therefore, you will get more resistance. It offers 12 levels of resistance, and it is recommended that beginners start from the level 1 and to increase the resistance based on their strength and stamina gradually. Below the seat, you will find the dial that will help you adjust the resistance. However, have in mind that you should not touch the piston when changing resistance level. It also produces a minimal amount of noise, which is great if you live in an apartment because you won’t disturb anyone. In overall, Stamina Body Trac Glider 1050 rowing machine is an excellent solution for your home workout plans and goals. It is good rowing machine for beginners that have unusual features. It is affordable, noiseless, lightweight, compact and you will get free motion rowing handles. On the other hand, with primary monitor, you won’t get all tech features as high-end models. But it is still durable and great for an everyday workout. It is difficult to find the reliable and best home-rowing machine for the affordable price, but now that is only a part of the history. By choosing First Degree Fitness Newport Challenge AR Water Rowing Machine, you will enjoy an extensive workout in the quiet of your home. It has a compact design and shiny red color, which makes an excellent addition to your workout accessories. It includes adjustable resistance, and that is a unique solution if you want to adjust to match your stamina and skill level. At the same time, extended warranty and sturdy build quality is the reason why we decided to talk about this fantastic rowing machine. First, we have to mention, that this particular water rowing machine has impressive build quality. It includes steel part frame and aluminum seat rail. Even though it is for home use, the quality of build is similar to other commercial grade rowing machines. Rower comes from quality parts, which will add the sturdiness and stability while exercising. The base contains rounded caps so that rower machine could stay on the ground and protect your floor from damage. Comfort is outstanding because it will give you the possibility to exercise without hassle. It contains fluid technology so that you can enjoy in comfortable and smooth rowing stroke. The ergonomic design means that you will get handle with a slight curve that will prevent hand and arm fatigue. To prevent blisters and provide you solid grip it has rubber foam on the handle. The seat will also help you relieve any pressure, which is perfect if you want to train frequently for long sessions. When it comes to resistance, it works through water resistance. It has paddled in the tank with water, and when you pull the handle, the paddles will spin. The faster you do it, the faster paddles will turn, and that will provide you more resistance. In overall, First Degree Fitness Newport Challenge AR Water Rowing Machine is an excellent and best rowing machine that most people praise online. It contains water resistance features, and it is quite affordable when compared with tools with similar characteristics. You will be able to save few hundreds of dollars by choosing this particular one and use it in the home for decades. You should have in mind that monitor is not the latest and without any latest features. Still, that is not a problem when you compare all benefits and advantages. Finding the best home rowing machine is not that simple. It requires a profound knowledge of its features so that you can consider the perfect one for you. If you don’t know what it is for, the rowing will help you work out your entire body. It is the most significant piece of workout machinery to have in the home. Some people think that home rowing machine will not provide you the same experience as real rowing. That is not true; you will be able to get the perfect amount of resistance as in water. That is the main reason why we decided to present you what you have to consider when purchasing rowing machine. The first thing that you should have in mind before you decide to purchase rowing machine is to check whether you have enough space for it. You should have in mind that most rowing machines will take space on a regular sofa. Hydraulic-piston types have the smallest footprint, while air and water resistance are most abundant. There are numerous rowing machines on the market and price range is between $100 to $3000 and even more. Therefore, you should figure out how much you want to spend because that will help you find the right one. However, you should have in mind that rowing machines under $500 are the low-end; between $500 and $700 mid-range and over $700 are high-end rowing machines. Air Resistance – This is the most common type in most gyms. Therefore, we determine resistance level by your rowing intensity. The more you row, the more significant is resistance and vice versa. Hydraulic-Piston Resistance – It is lightweight, compact and simple to store. You will be able to adjust resistance by changing hydraulic pistons. They are quiet. Magnetic Resistance – If you want quiet rowing performance that works on the magnetic braking system, then you should choose this particular type. The rowing motion is comfortable and smooth, and resistance is adjustable. These models are very durable. Water Resistance – Water rowers will provide you similar feel as you were on the water. They work the same way as air resistance rowers because you are going to determine resistance by intensity. It contains paddles that will move through water, and that creates resistance and decent noise. Full-body Workout – You should have in mind that most home rowing machines will engage all muscles in your body which is the main reason for its popularity. You should find the one that will apply little pressure on legs, hips, and joints after stroke. Suitable for Everyone – Rowing machines are a great way to perfect your training goals. The home rowers are here to provide you the possibility to workout indoors and to replicate the similar feel as in water. Therefore, you should check whether it has adjustable foot straps so that everyone could use it with comfort, and especially if you are taller than usual. Storing – The critical factor when purchasing home rowing machine is a possibility to save it without too much hassle. Of course, you won’t have to move it a lot but check for its weight and size so that you can see whether it can fit. Some machines can fold quickly, so if you have limited space, we recommend you to check this feature. Monitors & Computers – The technology changed the way we use typical products, and the same thing goes for rowing machines. Latest home rowing machines include monitor or computer that will help you measure distance, time and speed. Some of them have more advanced features such as heart rate monitor integration and possibility to communicate with other mobile devices. We have presented your thorough review and buying a guide to best home rowing machine of [year]. It is difficult to determine which one is the best because we introduced different types and features that could apply to different kinds of people. These best Home rowing machines are perfect for both professionals and beginners, and it will help you establish the groundwork for your further training. The best thing about rowers is that they will make you use full-body, which is an excellent combination of cardio and strength exercise. That is the main reason for their outstanding popularity. On the other hand, we recommend you to reread the reviews so that you can understand all information. That way you will learn how to find the reliable and rowing machine for you. If you think that, we have missed something, or if you want to share with us your experience with rowing machines, you should comment in the section below, and we will answer you in short notice. Looking for more best rowing machines? Find below link for rowing machine category from Amazon.